If Brian De Palma directed Mission to Mars for 10-year-olds who’ve never seen a science fiction film, he can be credited for crafting a marginally successful adventure. Isolated moments in this film serve the highest purpose of its genre, inspiring a sense of wonder and awe in the context of a fascinating future (specifically, the year 2020). But because most of us have seen a lot of science fiction films, it’s impossible to ignore this one’s derivative plot, cardboard characters, and drearily dumb dialogue. Despite an awesome and painstakingly authentic display of cool technology and dazzling special effects, Mission to Mars is light years away from 2001: A Space Odyssey on the scale of human intelligence. 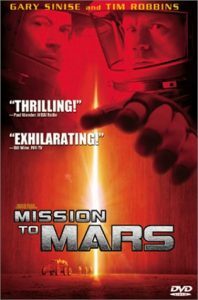 From the director of MISSION: IMPOSSIBLE comes the thrilling, eye-popping science fiction adventure MISSION TO MARS — starring Gary Sinise (SNAKE EYES) and Tim Robbins (AUSTIN POWERS: THE SPY WHO SHAGGED ME). The year is 2020, and the first manned mission to Mars, commanded by Luke Graham (Don Cheadle, OUT OF SIGHT), lands safely on the red planet. But the Martian landscape harbors a bizarre and shocking secret that leads to a mysterious disaster so catastrophic, it decimates the crew. Haunted by a cryptic last message from Graham, NASA launches the Mars Recovery Mission to investigate and bring back survivors — if there are any. Confronted with nearly insurmountable dangers, but propelled by deep friendship, the team finally lands on Mars and makes a discovery so amazing, it takes your breath away. MISSION TO MARS is an action-packed rocket ride that will enthrall you with its stunning special effects and keep you on the edge of your seat.